In Great Britain November the Fifth is known as Guy Fawkes Day which concludes with Bonfire Night where fireworks explode in the air and bonfires are lit upon which an effigy of gunpowder plotter Guido ‘Guy’ Fawkes is ritually burnt. For the uninitiated the Gunpowder Plot was a conspiracy by a group of Roman Catholics to assassinate the Protestant King James I and replace him with the Catholic Queen Elizabeth of Bohemia. They planned to do this by blowing up the Houses of Parliament on November the Fifth in the year 1605 when the King was due to address the Members at the opening of a new session. The plot was discovered when the night before the Kings attendance the palace guards caught Guy Fawkes in the cellars below the House with barrels of gunpowder ready to ignite. 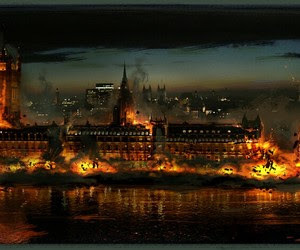 Guy Fawkes and his fellow conspirators were tortured mercilessly then tried for treason and convicted. The punishment for treason reflected the seriousness of the crime and the conspirators were subsequently hung, drawn and quartered after which their body parts were distributed around the Kingdom as a warning to others. Due to the treasonous behavior of the current inhabitants of the British Parliament, Guy Fawkes is being rehabilitated as a hero after more than four centuries as a villain. He is lauded as ‘the last man to enter Parliament with honorable intentions’ and his image is now used as a symbol of rebellion.